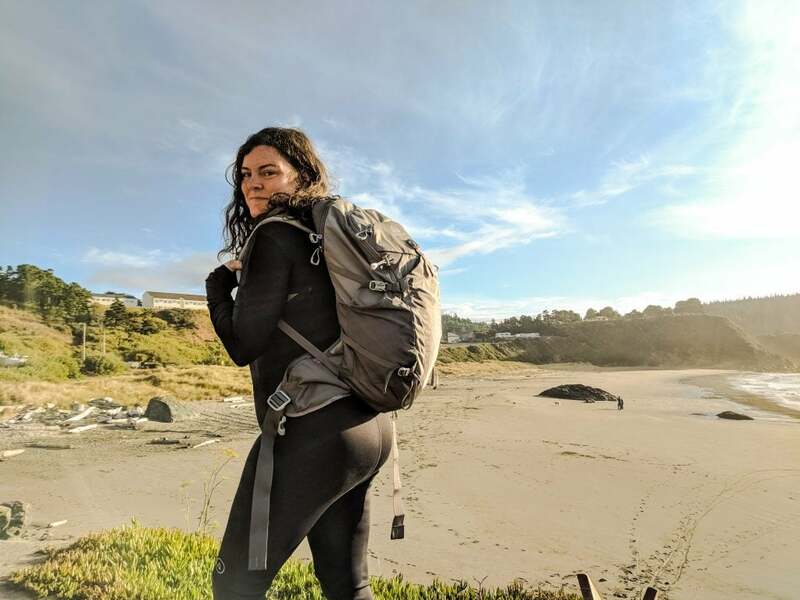 This Oregon Coast Trail article was brought to you by our friends at Gregory, the makers of sturdy outdoor backpacks that enable you to go as far as your feet and imagination can take you. Do you ever wonder what it is about the Oregon coast that makes it so unusually epic? Is it the rocky headlands and sea stacks that are both lush and rugged? Is it the mystical inversion blankets of fog that blow in? The reliably welcoming longshoreman’s bars where you can still get a cheap boilermaker and a fresh plate of fish n’ chips? 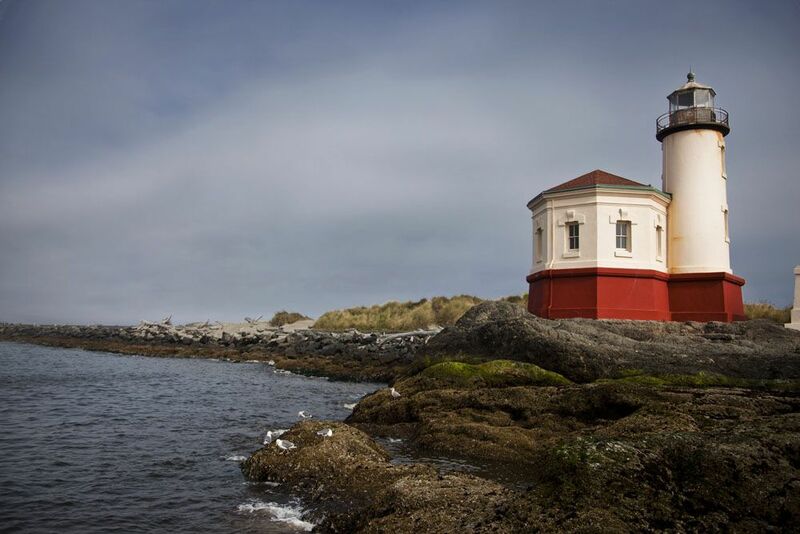 Or are we just that nostalgic for every location shot in The Goonies? The answer is a combination of all of these and more. 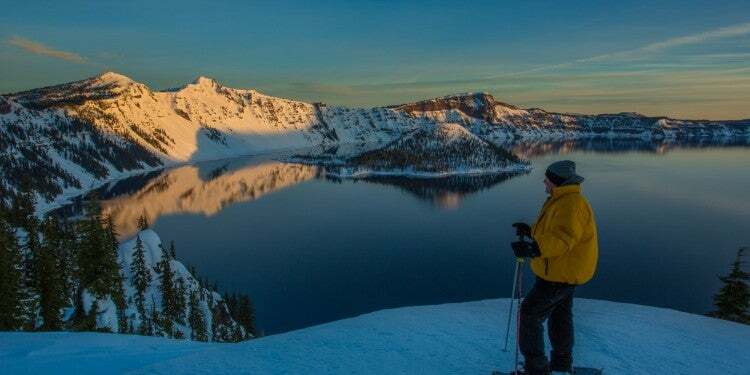 One thing that certainly makes Oregon unique is that all 363 miles of its Pacific waterfront are public, earning it the nickname “The People’s Coast.” In 1913, when the rest of the country was still getting used to the idea of a National Parks System setting aside land for conservation and recreation, Oregonians happily embraced a bill that established the state’s beaches as a public highway. Exploring the Oregon Coast Trail with Gregory packs / Image from The Dyrt camper Meghan O. 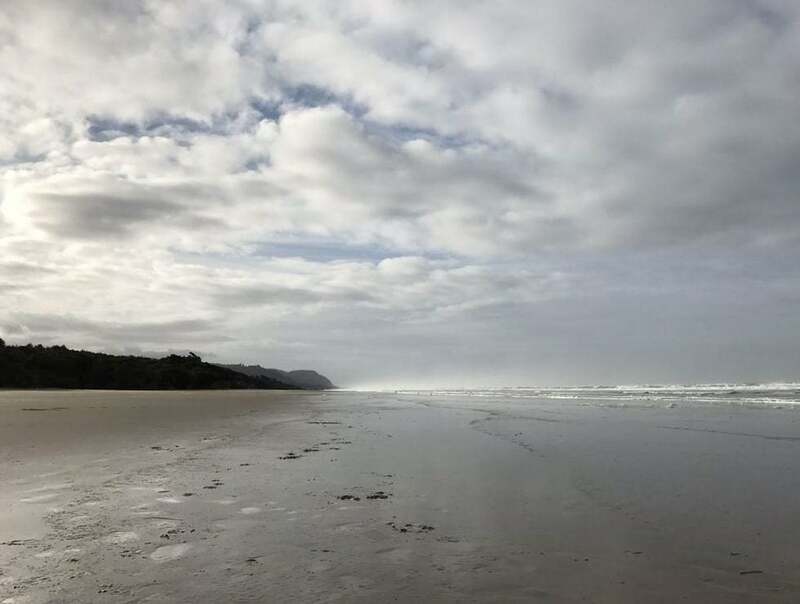 That decision laid the groundwork for Governor Tom McCall’s 1967 Beach Bill, as well as the establishment of 75 state parks along The People’s Coast, which have together preserved one of Oregon’s best resources for past and future generations. You can, of course, camp and explore piece by piece and park by park, if you like. But for a truly Oregonian adventure, you can cover the entirety of The People’s Coast by thru-hiking the Oregon Coast Trail. The Oregon Coast Trail was conceived of in 1959 by University of Oregon geography professor Samuel N. Dicken. However, its development didn’t start until the 1970s, it wasn’t really hikeable until the late 1980s, and parts of the Oregon Coast Trail are still being improved and completed today. Unlike the AT or PCT, which carry hikers solely along trails, the current layout of the Oregon Coast Trail still necessitates that hikers walk along portions of highway and back roads. In that regard, it’s not unlike other state-specific thru-hikes that are still evolving decades after they were first dreamed up, like North Carolina’s Mountains to Sea Trail. The inconvenience of hiking a little pavement, however, is made up for by the frequency of campgrounds you’ll encounter. 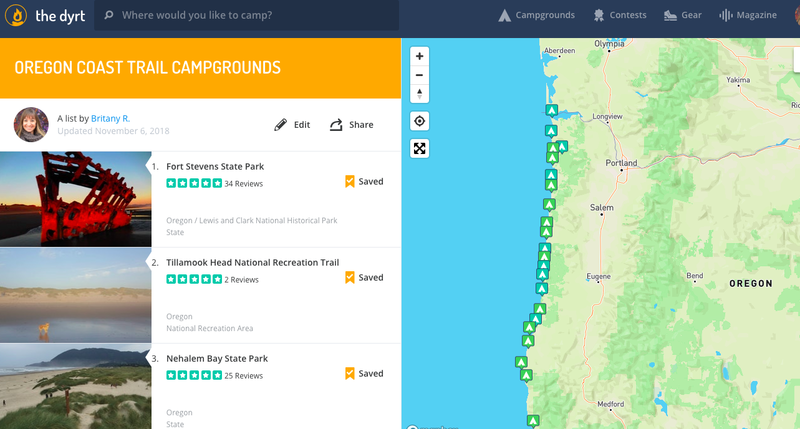 Rather than worrying about a sufferfest through a high-mileage day just to reach camp before dark, you can rest assured knowing the 75 state parks lining The People’s Coast average out to a park about every five miles, some with multiple campgrounds per park. 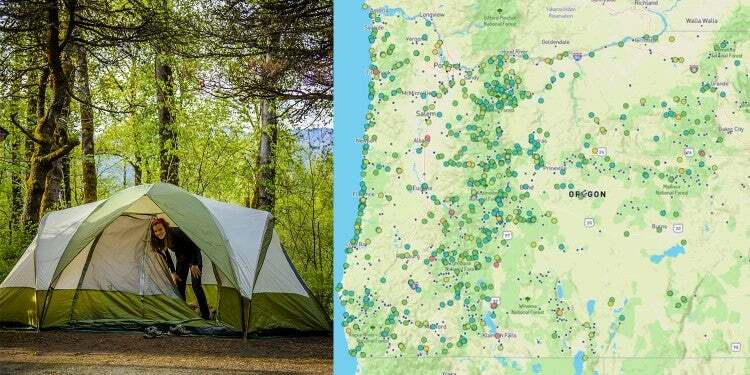 Many of the campgrounds also offer hike-in and bike-in campgrounds just for those camping without a car, and there are even more opportunities for free dispersed and beach camping along the way. 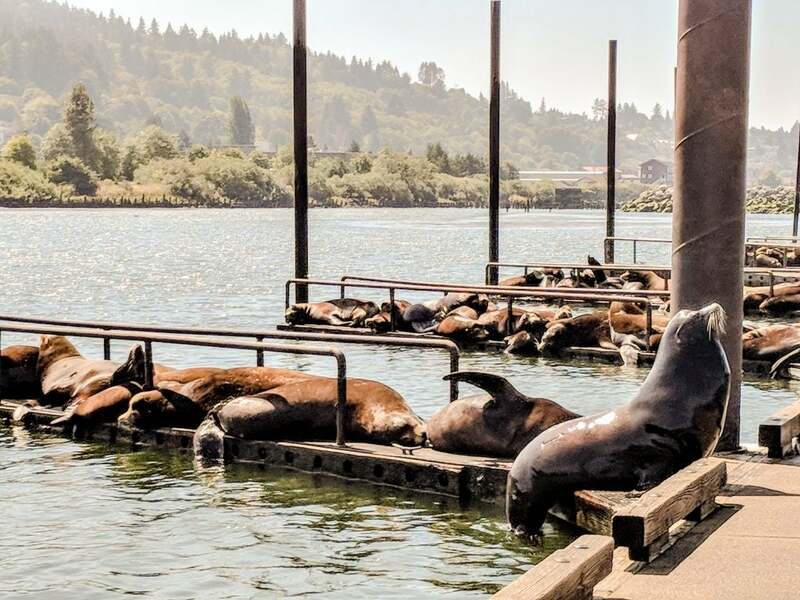 Sea lions on docks near Astoria, OR / Image from The Dyrt camper Meghan O.
Appropriately enough, the People’s Coast is bookended by rivers—the Columbia to the north and the Winchuck River to the south. At the north end, the Oregon Coast Trail starts on the tiny slip of land that juts out where the massive Columbia River meets the Pacific Ocean. 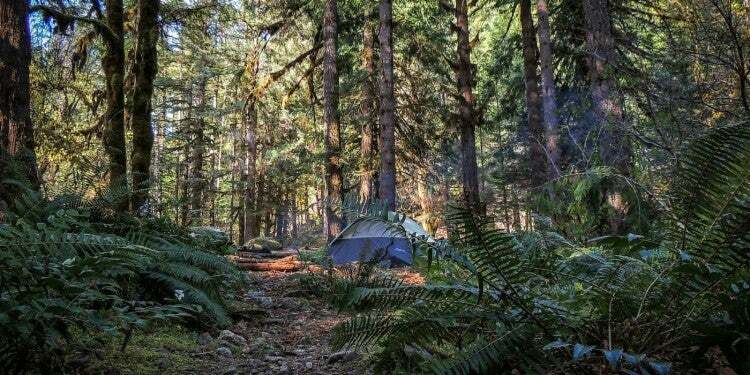 Wave to the state of Washington before you turn south and start hiking towards Fort Stevens State Park Campground, which is just four miles down the trail. You can stick around to soak up the quirky vibes in Astoria, where craft breweries and distilling outfits have taken over the old canning warehouses on the waterfront and charming old houses still line the hills overlooking the Columbia River. One of the most popular is the house featured in The Goonies, though the current owners discourage anyone from taking pictures in the driveway. That’s not the only movie filmed in Astoria— Kindergarten Cop was shot here, too. Grab a beer at Hondo’s, a teeny brewery off the main drag where the locals hang out, as well as a very good dog named Dexter. Or you can keep on trekking towards the southern terminus of the OCT at the California border. Along the way, you’ll walk through mossy forests whose beds are blanketed in ferns, up craggy headlands, along foggy beaches, over driftwood stacks, and through massive sand dunes. Photo by The Dyrt camper Haley W.
The Oregon Coast Trail has never been so popular. Part of that is due to other, better-known big trails filling up. Part of it is good marketing and more people moving to the Pacific Northwest. It’s also an incredibly unique trail that offers a lot of variety and novelty, and its very approachable for beginners, section hikers, and veteran thru-hikers alike. 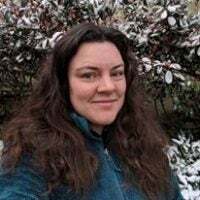 That’s good news for business owners in Oregon’s coastal towns, many of which have turned to tourism to weather shifts in the fishing and canning industries. Fortunately for you, all those businesses won’t be far, even if you’re in the middle of your hike. One of the benefits of the OCT being so close to the small towns that line coast is that you don’t have to carry as much in the way of food and drink as you would while climbing up and over, say, the Sierra Nevada. Instead you can pop into Camp 18 for enormous cinnamon rolls in Cannon Beach, swing by Yachats Brewing + Farmstore for lunch, grab a cup of joe at One Lump or Two in Port Orford, or treat yourself to lunch at Tony’s Crab Shack in Bandon. 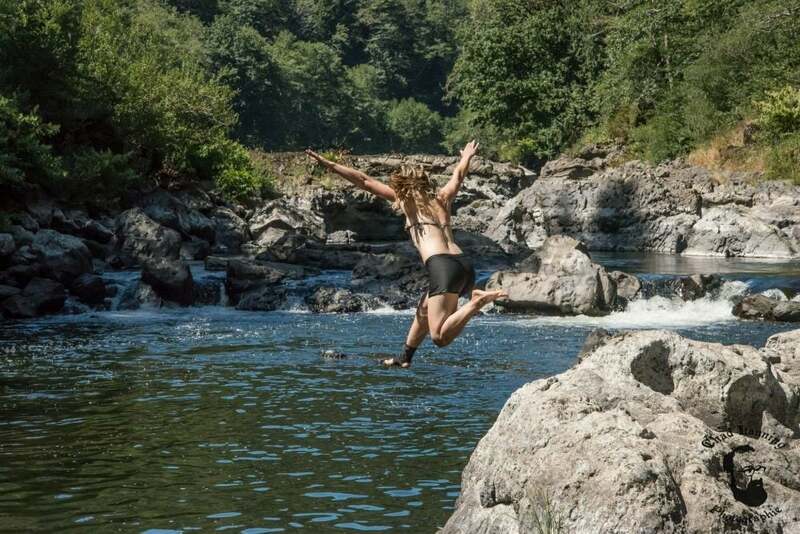 With a name like “The People’s Coast,” you can expect less solitude than Cheryl Strayed discovered in Wild and more crossing paths with rangers, longshoremen and locals. 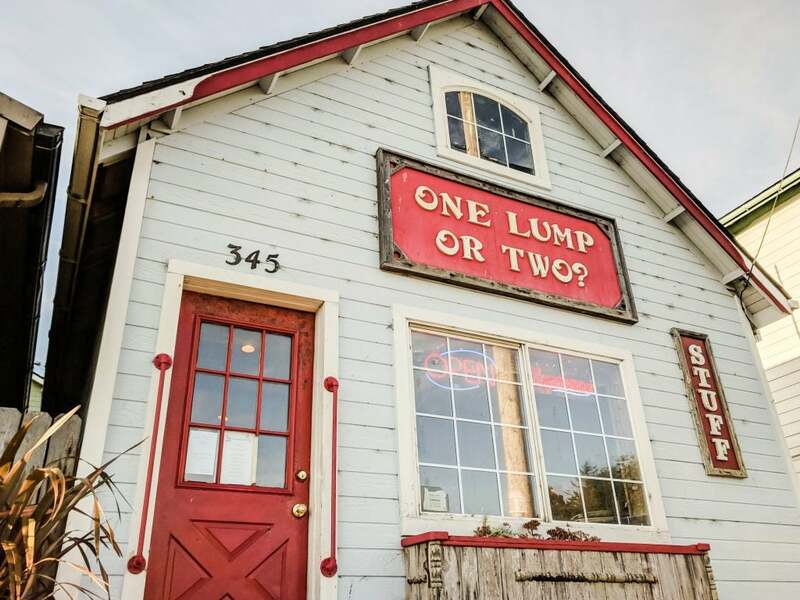 One Lump or Two cafe along the Oregon Coast Trail / Image from The Dyrt camper Meghan O. There are all sorts of fun detours to make, from old Victorians to pretty lighthouses to brewpubs and art galleries. You can also try kayaking, fishing, SUPing, offroading, and more if you want to shake up your workout. Birding is popular along the Oregon Coast Trail, too. There are hundreds of species of birds to observe, though from March 15 – Sep. 15, be mindful of protections in place for the Snowy Plover that could affect where you camp and whether you can have a campfire. Hug Sitka spruce that are hundreds of years old at pretty much every state park you pass through! 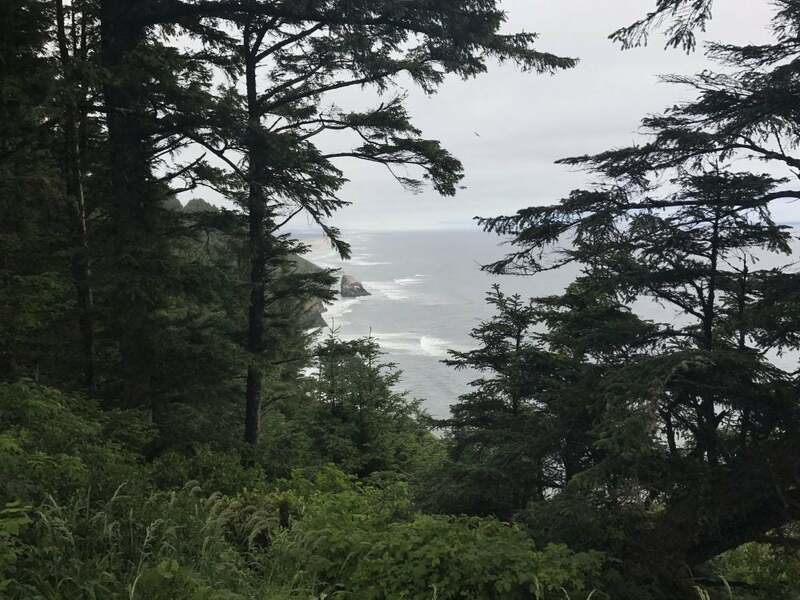 One of the downsides is that, because the Oregon Coast Trail is still relatively new, it lacks some of the niceties you might be accustomed to along more established trails. Signage is improving, but not always abundant. There are a small handful of books about The People’s Coast, mostly aimed at day hikers, so you might have to work harder to plan exactly how far you’re going to go each day and where you might stop to camp or find other resources. 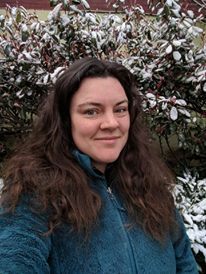 Some of the best resources come from people who have completed their own thru-hikes and can speak from experience how to handle gaps in the trail or tricky portions. 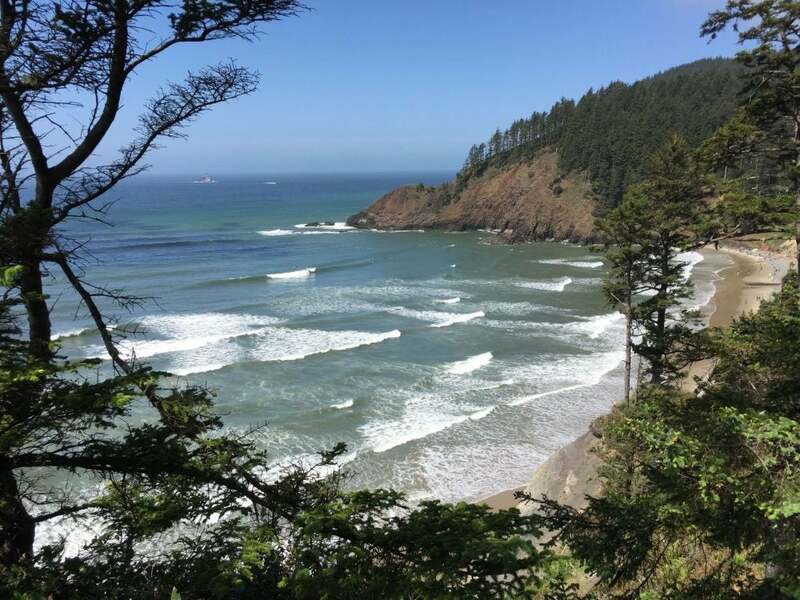 Exploring the Oregon Coast Trail is the most comprehensive option, written by a dedicated day-hiker who strung together portions of the trail over several summers. Connie Soper is a local expert on all things OCT, and her book reflects that with fascinating history and recommendations alongside detailed maps. Definitely bring a map (preferably topographical) to help with any geographic hangups. A good compass never hurts, either. A chart of the tides and timetables will certainly come in handy. 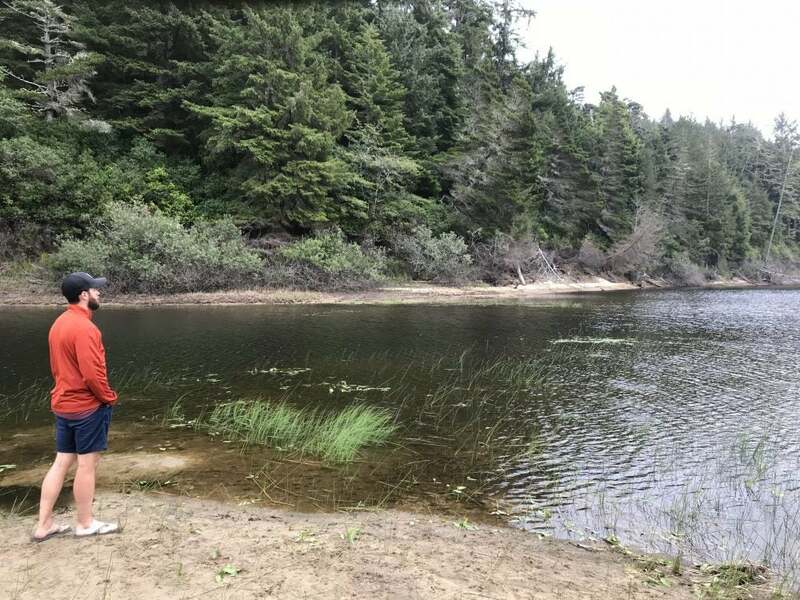 One of the special challenges of coastal camping and hiking is planning your journey around the water levels, which can vary dramatically in some sections, and depending on the time of year. 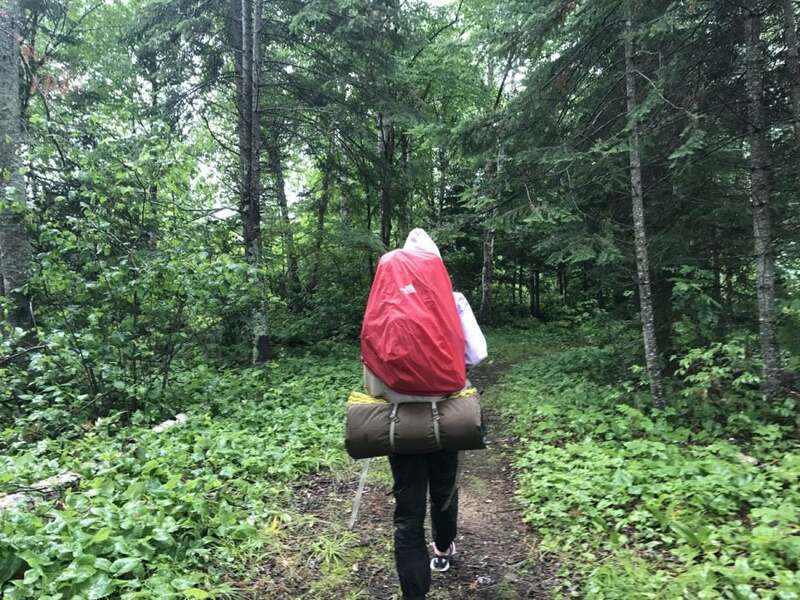 Photo by The Dyrt camper Andrea G.
You’ll want a serious outdoor backpack of course, as you would for any major thru-hike. 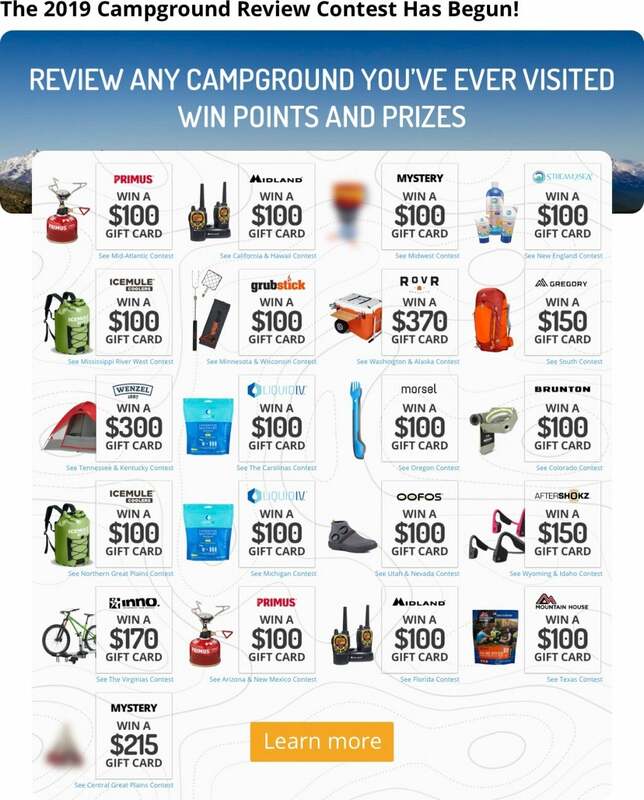 If you are purchasing or upgrading gear for this trip, consider opting for gear in brighter colors too, that will help with visibility on the road sections. Because this is the Pacific Northwest, you’ll also want a good backpack rain cover. Even if the weather is clear, any amount of waterproofing is a good idea so close to all the fog, rivers, and waves. One of the nice perks of this trail running through so many communities is that it’s incredibly easy to reach, even if you don’t fancy leaving a car at the trailhead for four to five weeks. 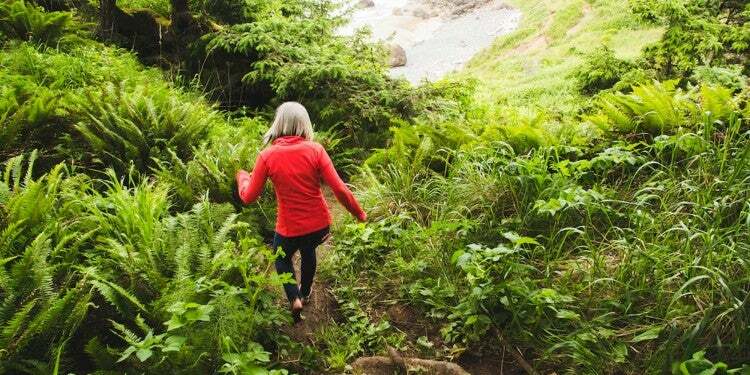 It’s absolutely possible to do the Oregon Coast Trail even if you are camping without a car. You can take the NorthWest POINT bus from Portland to Astoria to begin at the north end. At the southern terminus, you can take an Amtrak shuttle bus from Brookings to either Medford, Oregon or to Klamath, California to catch a train to Portland, Seattle, San Francisco, LA, or parts further on down the line. Medford has its own airport, too, if you prefer to fly. The NW Connector visitor pass is another bus option for getting up and down the coast, as are Curry Public Transit and the Tillamook Bus. 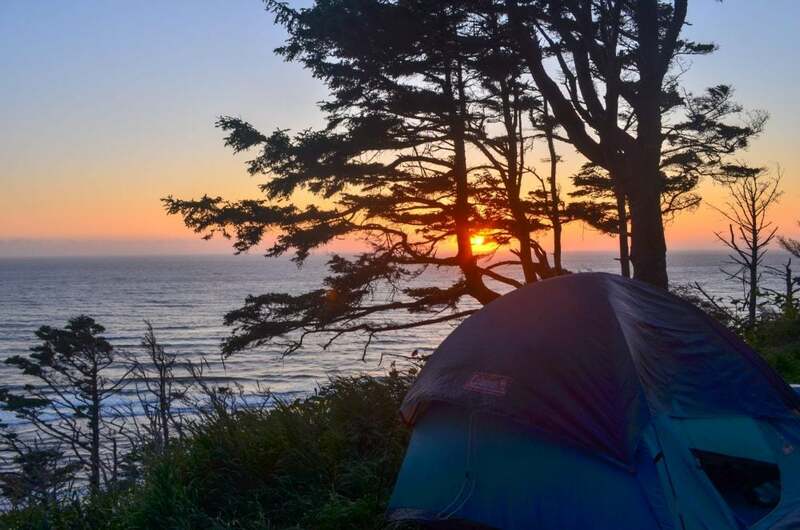 There are plenty of campgrounds along the Oregon Coast that are easily accessible to the Oregon Coast Trail. But keep in mind, many of these popular campgrounds book out months in advance for the summer season—you’ll want to plan accordingly. “Such a great place to stay on the Oregon coast! I love this campground because it’s on the coast, very beautiful and spacious. Great sites around to see including the mouth of the Columbia River. Spacious sites you can reserve and electric/water etc. There is even an area for hiker and bikers. You’re close to Astoria, Gearhart, Cannon Beach and Portland is only an hour and a half away.” –The Dyrt camper Alicia F.
Tillamook Head National Recreation Trail / Image from The Dyrt camper Bjorn S.
“There were three well-built open cabins, each with 4 wooden bunk beds and room on the floor for a couple more to sleep, + you could camp within a small radius around them. A large communal fire pit was right in the middle, with a covered area and nice bathrooms nearby, with nice signage throughout the area, including full maps and history of several Lewis & Clark lookout sites.” –The Dyrt camper Bjorn S.
Horseback riding on the beach at Nehalem Bay / Image from The Dyrt camper Dario C.
“Really cool atmosphere just steps away from the beach. The sounds of the waves can be heard right from your site. Yurt is highly recommended and sleeps 5. Really liked that each yurt had its own deck, picnic table, and fire pit. The shrubbery around the campgrounds was really cool and offered extra privacy. They also had equestrian sites as well as tent and electric RV.” –The Dyrt camper Kelly C.
Nehalem Falls / Image from The Dyrt camper Chad L.
“Hands down one of the best campsites and very dog-friendly! Walk and drive in sites, firewood is sold here.” –The Dyrt camper Haley W.
Fishing for sea bass at Barview Jetty / Image from The Dyrt camper Kayla M.
“Barview Jetty Campground, is one of the best camping spots. The campground has a combination of tent sites and rv sites. additionally there are cabins available. There are restrooms located throughout the campground, and showers, always clean. 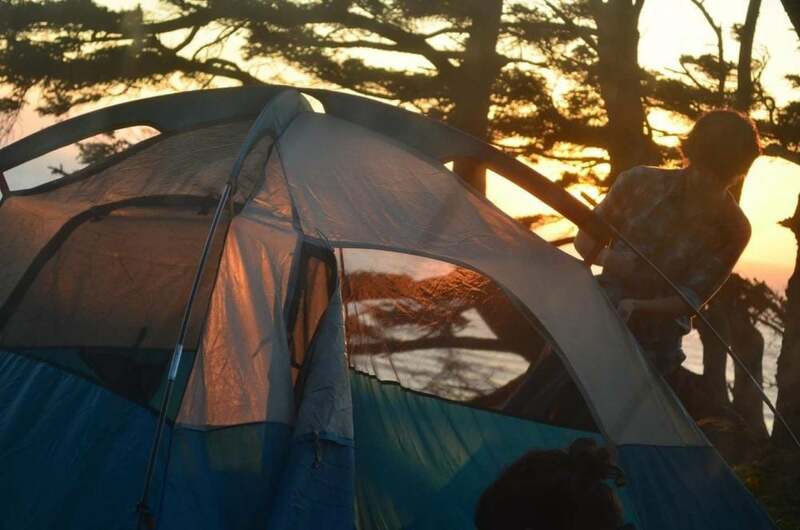 Located very close to the beach, super close.” –The Dyrt camper Kayla M.
Setting up camp at Cape Lookout State Park / Image from The Dyrt camper Haley W.
“Just stayed at Cape Lookout this week and we loved it! We stayed in Loop C at site C25. The site was one of the few set amongst trees so there was a little more privacy than other sites. It was located near two clean bathrooms with showers and hot water. We could hear the ocean from our site and it was a short walk to a gorgeous sandy beach!” –-The Dyrt camper Lisa M.
Webb County Park / Image from The Dyrt camper Connor J. “This a nice campground that’s just across the street from the beach and next to a little market. 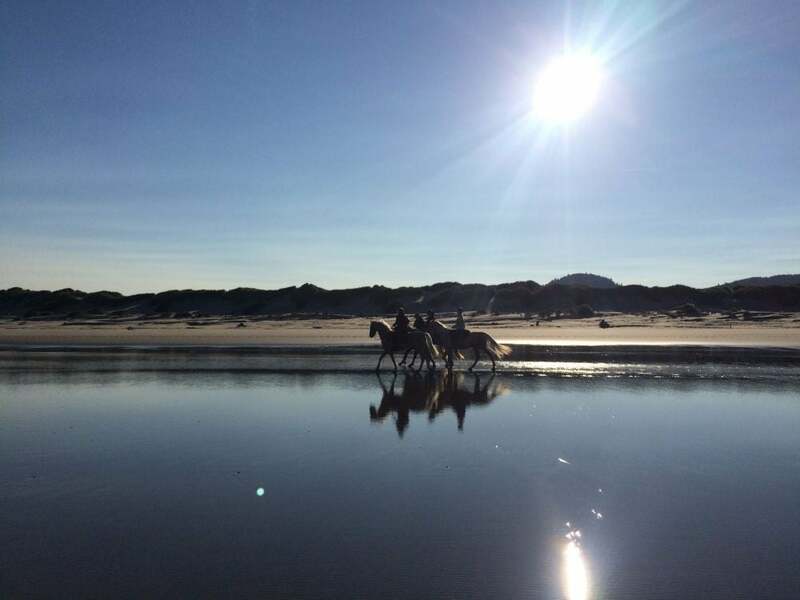 It’s ideal if you want to spend your time at the beach and walking the dunes. The restrooms were clean and the showers were hot (from what I remember). There are dozens of bunnies at this campground. They keep to themselves and they are very cute! The Pelican Brewery is just across the street on the beach and is a great place to grab a beer or if you don’t feel like cooking, it has great food.” –The Dyrt camper Rachel G.
Devils Lake State Park / Image from The Dyrt camper Jessica C.
“I stayed in one of the dog friendly yurts that they offered at Devils Lake, and had a great time. It is very nice, and well maintained. You can either set up a tent, stay in a yurt, or bring your camper. The campsite is not too far from town, and walkable distance to the beach. You also have a nice path back to your own lake!” –The Dyrt camper Natasha R.
Yurt at Beverly Beach State Park / Image from The Dyrt camper Bjorn S.
“There is an amazing restaurant, Sea Hag, just up the road, and you can stop at Devil’s Punchbowl State Park at low tide to see thousands of sea stars. This campsite has an amazing location to site see for a longer stay without moving camp.” –The Dyrt camper Danielle R.
“So much to say about this place! We stayed in a yurt in this camp ground, which was a good decision because it rains often here. Loved our spot! We had plenty of space and we were right next to the trail that leads to the ocean. The ocean is quite and relaxing with not many people. 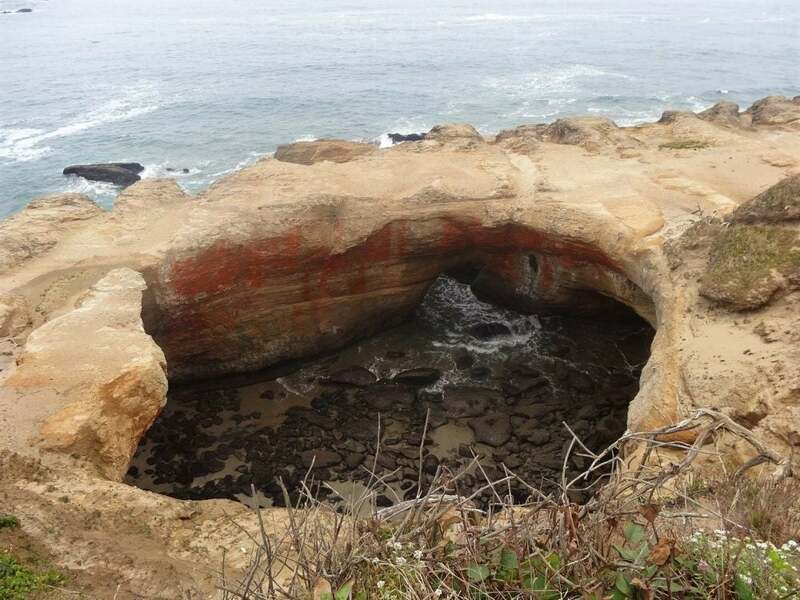 We saw a bald eagle on the beach.” –The Dyrt camper Brandi B.
Devil’s Punchbowl near Beachside State Recreation Area / Image from The Dyrt camper Darin D.
“This is one of my favorite sites on the Oregon coast. It’s easy to get to, right off Hwy 101 between Yachats and Waldport. This does make for some traffic noise, which settles in the eve. But well worth the beachfront sites. Steps from the the crashing waves and miles of unpopulated clean sandy beaches. Clean restrooms with nice hot showers for paying campers and at a reasonable rate, under 30 bucks a night, well worth it.” –The Dyrt camper Tj B.
Thor’s Well at Cape Perptua / Image from The Dyrt camper Gabrielle S.
“This campground is GOLD! The campground is full of hiking trails, including some that take you up to great views (also drive-able, but half the fun is the hike!). There is a quarter mile trail that takes you to the Visitor Center that overlooks the ocean. Plenty of people were there watching for whales, but we unfortunately didn’t see any. 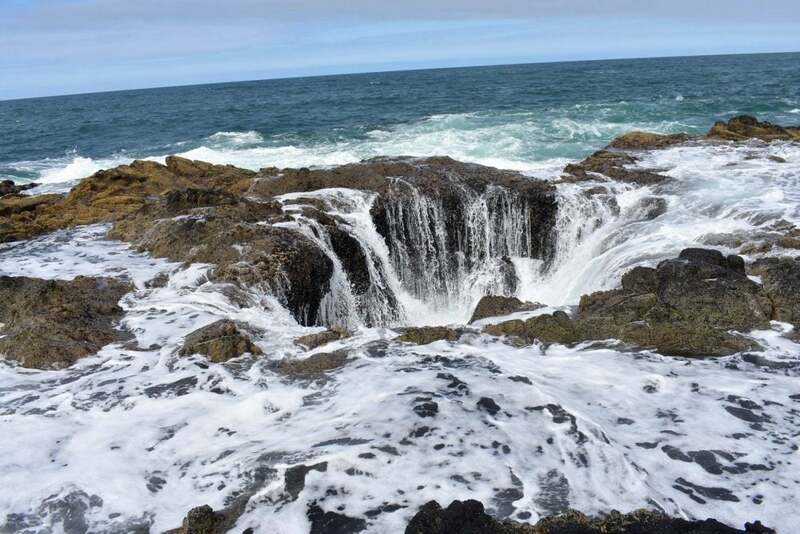 From the Visitor Center, there are several different trails to various geological formations such as Thor’s Well, Devil’s Churn, and Spouting Horn. It really shows the best of the Oregon coast.” –The Dyrt camper Gabrielle S.
Watching the sunset over the ocean at Carl G. Washburne Memorial State Park / Image from The Dyrt camper Haley W.
“Washburne is located on the east side of Highway 101 with a buffer of native plants and trees between you and the highway. The campsites are spacious and are available on a first come first served basis except for the two yurts which are reservable. In the campground at night, you can hear the pounding surf. There is a creek running through the campground, and elk have been known to wander through. Wild rhododendrons bloom in spring.” –The Dyrt camper Tom N.
Oregon Coast Trail / Image from The Dyrt camper Natalie W.
“Smaller campground, and very clean (aside from the sand!). My kiddo & I consider this a favorite since it’s got some great views, and swingset (priorities, you know! ).” –The Dyrt camper Cassie M.
Carter Lake / Image from The Dyrt camper Lindsay M.
“Sites are small but there is plenty of wood to collect for a fire. No wood sold at the site, no soap in the bathrooms so bring Purell! 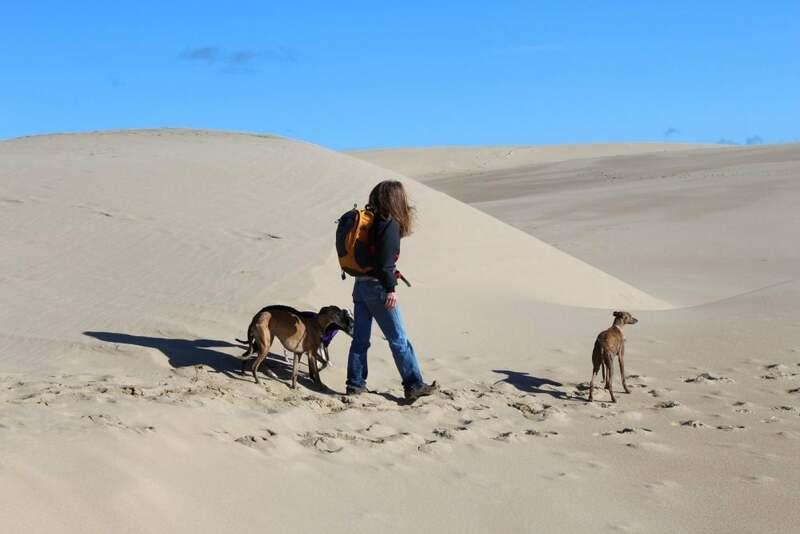 Very convenient to hiking at the Dunes.” –The Dyrt camper Lindsay M.
The sand dunes at Eel Creek / Image from The Dyrt camper Jill R.
“The trailhead is in Lakeside, OR, off Hwy 101 on the Oregon coast. The trail takes you across the dunes, through a gorgeous coastal forest ending on the most remote stretch of coast you could imagine. Eel Creek Campground is right next door. The sites seem small at first, but they open up as you walk back into them. Lots of natural vegetation makes all the sites very private. 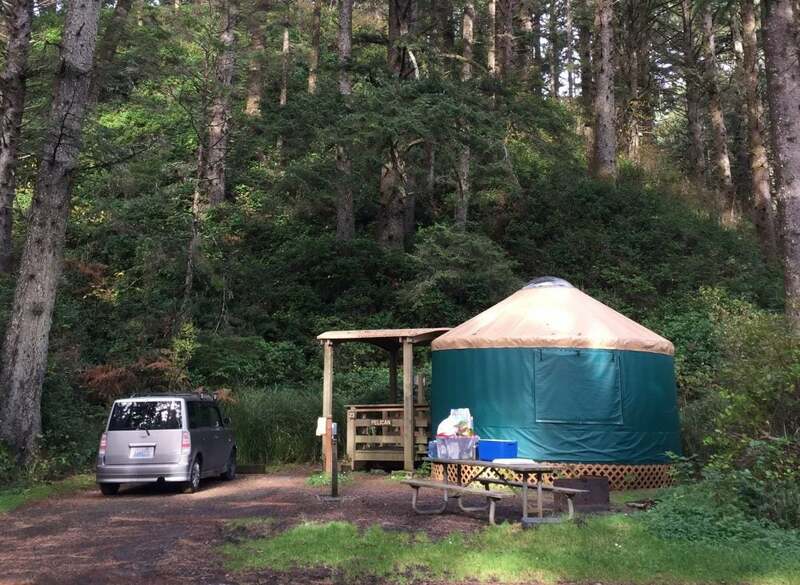 This has become my go to local campground when I have a few days off.” –The Dyrt camper Jill R.
Bluebill Campground / Image from The Dyrt camper Letha H.
“My go-to spot if I come back to the Oregon dunes area. This campground, while central in the dune and OHV area, doesn’t allow OHVs in the grounds so it is by far the quietest and most secluded of the campgrounds in the area. Surrounded by trees and right up against the lake with a great loop trail around it. Barely has a bar of cell service (Verizon) when there. Has bathrooms and fresh water available as well. 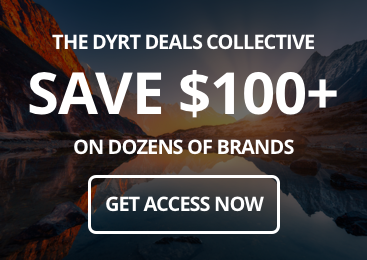 And spots are large with good privacy.” —The Dyrt camper Trevor C.
“The park employee that checked us in was the nicest park employee that I have ever met and she was very helpful too. The majority of the sites had some greenery or shrubs to add a little privacy to each spot which is nice. The beach is a shortish walk from the campsite. We watched the sun go down over the bay and it was just the perfect spot.” –The Dyrt camper Kyrie G.
The historic Coquille River Lighthouse at Bullards Beach / Image from The Dyrt camper Amanda M.
“The campground is nice with RV and tent sites; each site has a fire ring and a bench table with access to water and clean bathrooms. The campground is not directly on the beach, but is a hike or a short bike ride or car ride away. The road/trail out the the lighthouse is pretty, with small, rolling sand dune bluffs. The shoreline is rocky and wild. The area has a lot of mosquitos, but that is to be expected. 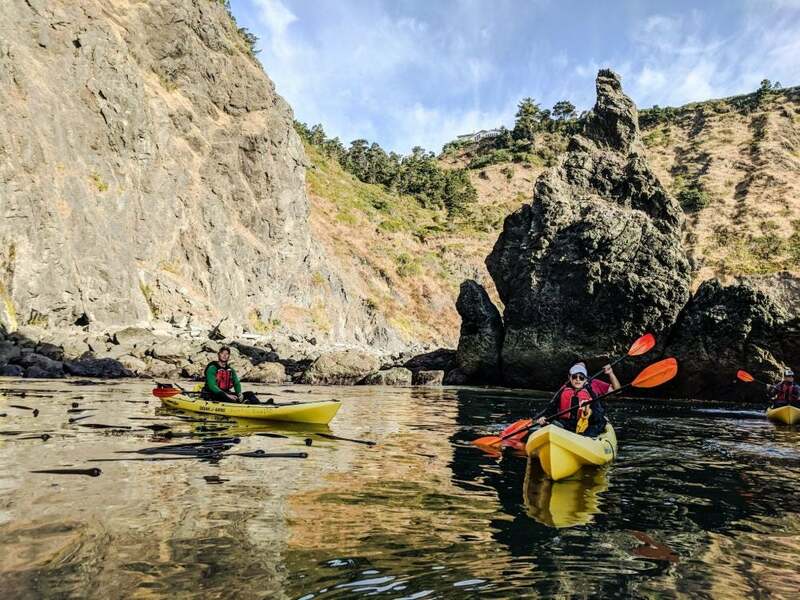 There are some nice-looking yurts available to rent if you don’t want to battle the bugs and sleep on the ground.” –The Dyrt camper Amanda M.
Kayaking at Cape Blanco / Image from The Dyrt camper Meghan O. “The campground has free showers, flush toilets, sinks, firewood for sale, and beach access. The sites have full hookups, fire pits, tables, and very long paved drives. 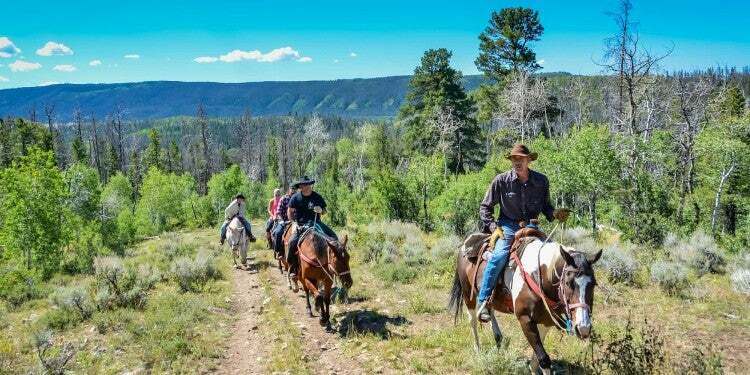 A bikers’ camp, group camp, and horse camp are also available. It is very windy here, but the plants surrounding the sites keep out most of the coastal wind and also provide plenty of privacy from other sites. Be prepared for cold weather and misty air. Dump station is under construction and not open for use right now.” –The Dyrt camper Haley C.
“Oregon does it right! While there are traditional spots for RV and tent camping, the Hike and Bike area was awesome. Each spot is private with a table and fire pit. Showers are included in your fee, the campground is quiet, and there is a nice walk to the beach (dogs are allowed). The campground is well maintained and clean.” –The Dyrt camper Tim J. 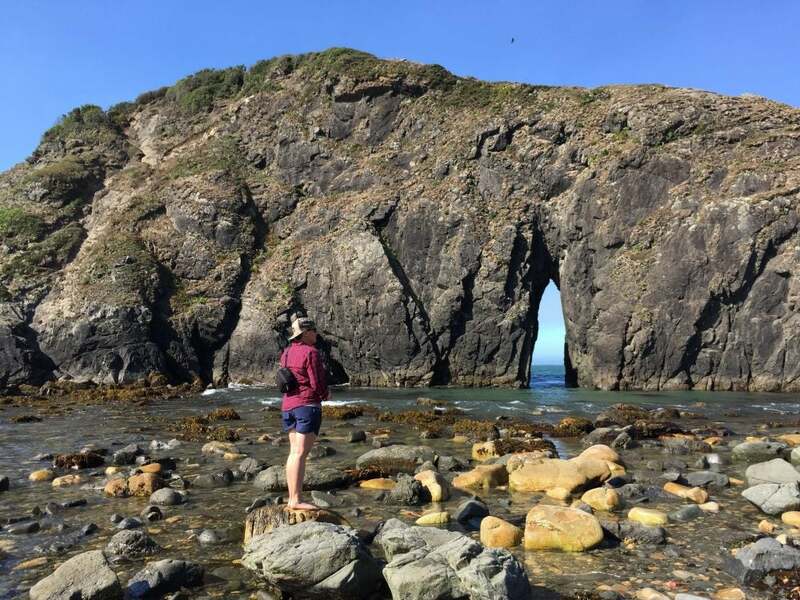 Natural arch at Harris Beach / Image from The Dyrt camper Carly M.
“This is one of the prettiest State Park campgrounds along Oregon’s Southern Coast! Just off Hwy 101 and less than a mile north of Brookings, OR. This campground has many Full hookup sites with plenty of tent sites too. There is an amphitheater with bench seating that ranger talks are hosted pretty much nightly. We attended one and had a great time watching a moving and learning about the local whales that frequent the coastline there.” —The Dyrt camper Kelli B.
Dave Lacey of South Coast Tours in Port Orford signing the official Surfrider Foundation surfboard to stand against offshore drilling in the Pacific Northwest // Image from The Dyrt camper Meghan O. When the word is only just getting out about the Oregon Coast Trail (and everything else that makes the Oregon coast so magical), it’s hard to believe that Samuel N. Dicken’s dream is already fifty years old. 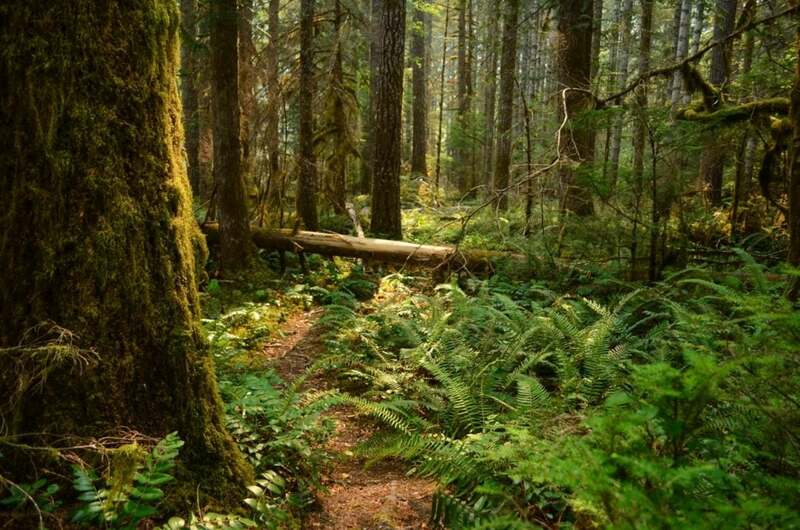 It may be years before all the gaps in the Oregon Coast Trail are addressed by the cities and counties the trail stretches through, not to mention the many volunteers it takes to maintain the present trail. Yet the more popular the Oregon Coast Trail becomes, the more resources there will be to complete and improve the experience. The biggest threat to the People’s Coast is the possibility of offshore drilling that is currently threatening coastal towns around the country. 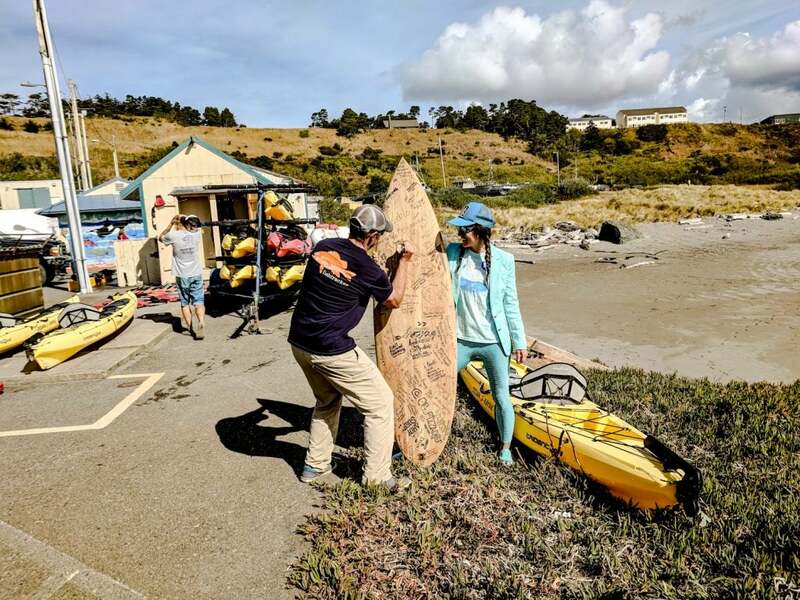 The Surfrider Foundation is currently working its way up and down the Oregon and Washington Coasts to collect signatures from business owners who oppose offshore oil drilling. 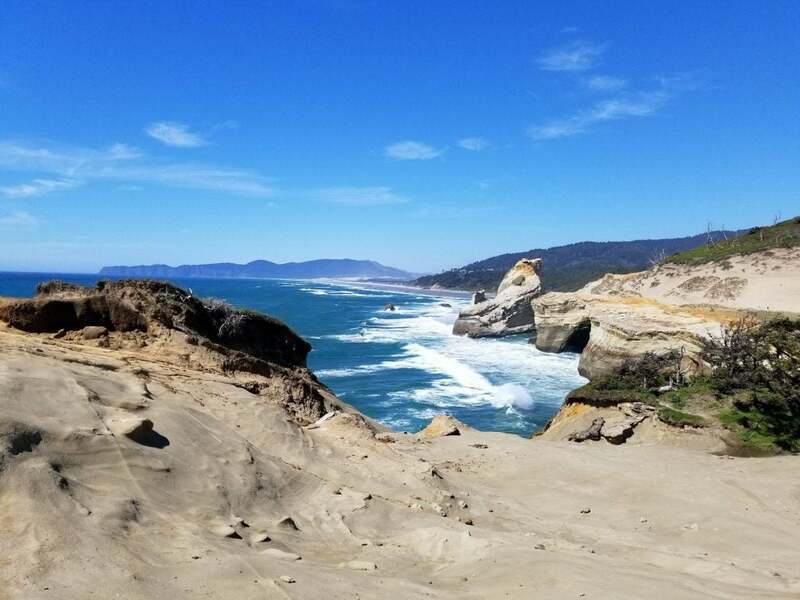 The goal is to protect the magnificent views that attract people to Oregon’s beaches and headlands, as well as delicate environments that provide habitat to rare and threatened animals like the Snowy Plover. According to Surfrider, the cities of Newport, Toledo, Port Orford, Gold Beach, Lincoln City, and Yachats, the Siletz Tribal Council, and the ports of Newport and Toledo have all passed resolutions against offshore drilling. 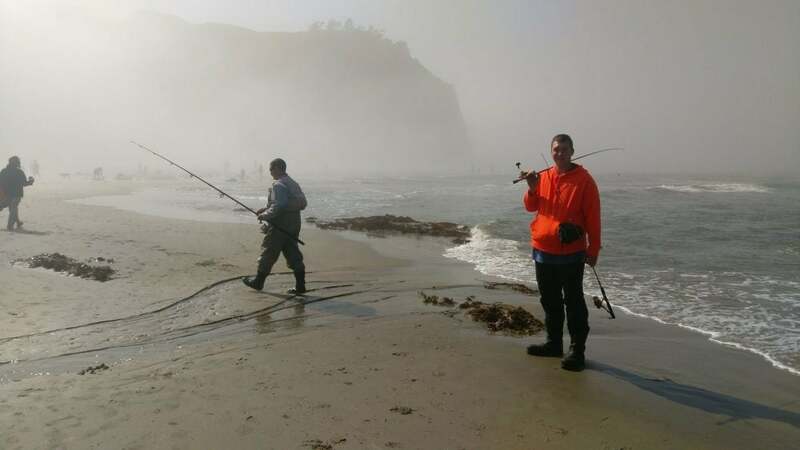 Supporting them as you enjoy the Oregon Coast Trail is one way to demonstrate the value of some 25,000 jobs created by tourism, recreation and fishing on the Oregon Coast are, as well as how priceless this one of a kind landscape is to outdoor enthusiasts.